In this story, a king of Greece wishes to have the touch of gold. 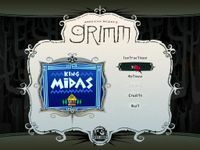 But when he gets a chance to renew his greed and ends up with no punishment, it's time for an extreme makeover: Grimm edition! Follow King Midas throughout the Greek plains, the Muses' music court, Midas' kingdom, the local barber's place, Midas' backyard, the town port, the river Patoclames, Hades and the city of Olympus. Remember, kiddies: Wishes always backfire! Source: Wikipedia, "American McGee's Grimm", available under the CC-BY-SA License.